Minnesota Small Business Administration (SBA) Director Nancy Libersky (yellow jacket) presents Hmong American Partnership CEO Bao Vang , to Libersky's right, with a check for $350,000 that the nonprofit small business counselor and lender can use for microloans in Ramsey and a few other counties. 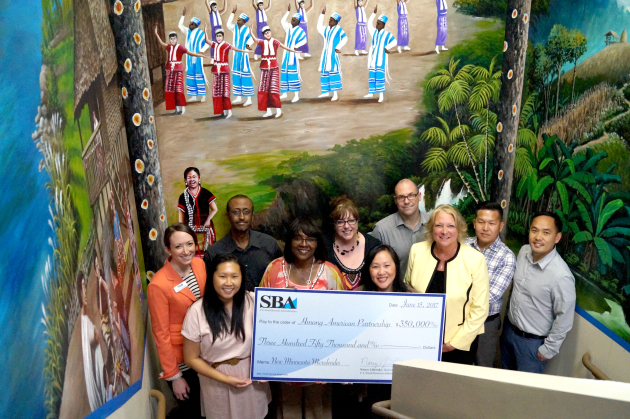 The Small Business Administration (SBA) has provided the Hmong American Partnership (HAP) $350,000 to loan to small businesses through its micro-lending program in in Anoka, Dakota, Hennepin, Ramsey, Scott and Washington counties. The SBA microloan program provides loans up to $50,000 to help small businesses and certain not-for-profit childcare centers start up and expand. The average SBA microloan in Minnesota in 2016 was about $16,000. In addition to funding, successful applicants will also benefit from counseling and training to help businesses launch or expand more successfully. CEO Bao Vang of HAP said the economic development organization is “very excited to be one of the newest micro loan SBA lenders in the Twin Cities region. “We pride ourselves in understanding the unique business needs of the Hmong, Southeast Asian, and immigrant and refugee communities,” Vang said. “With SBA support, we will continue to work towards achieving our mission and moving our communities from poverty to prosperity. The SBA provides funds to specially designated nonprofit lenders, such as HAP, which also have experience in management and technical assistance. Virtually all types of for-profit businesses that meet standards for the SBA Advantage 7(a) Loan Guaranty Program may apply for a microloan, provided a micro-lender works in the geographic area of the business.